You'd be hard-pressed to find a family happier than the Gallaghers on Saturday afternoon in Talladega. 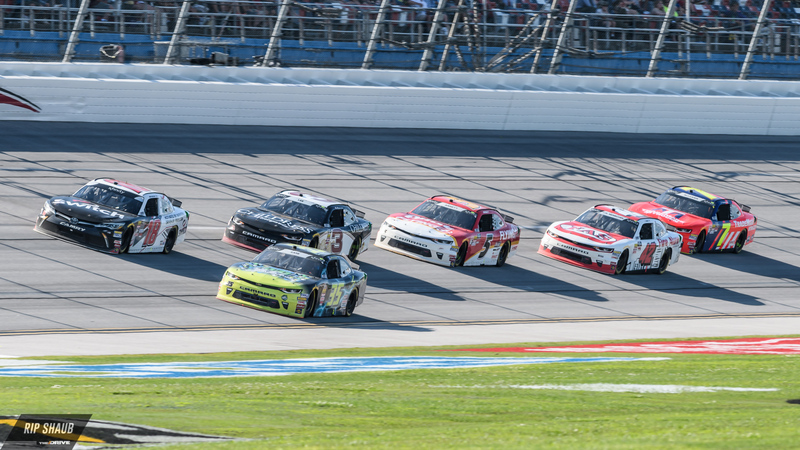 Driving for his father's team, Spencer Gallagher managed to lead just one lap of the weekend's Xfinity Series race, and luckily, it was the only one that mattered. After a final-minute thriller that was heightened via a restart stall by then-leader Austin Cindric, the No. 23 Allegiant Chevrolet played the strategy perfectly and awarded Gallagher his first career Xfinity victory. Daniel Hemric and his No. 21 Chevrolet commandeered the first stage of the race by leading all laps under green during that stretch. The young driver started on pole and retained the position ahead of the fluctuating field, surviving a hectic crash on Lap 33. That incident was brought on when Ty Majeski swerved offline towards the No. 28 car of Dylan Lupton shortly into the second stage, crashing out six cars including Ryan Truex who had previously finished eight consecutive races in the top-15. This cleared the back of the field for Elliott Sadler who climbed from dead-last to the front in just 42 laps. 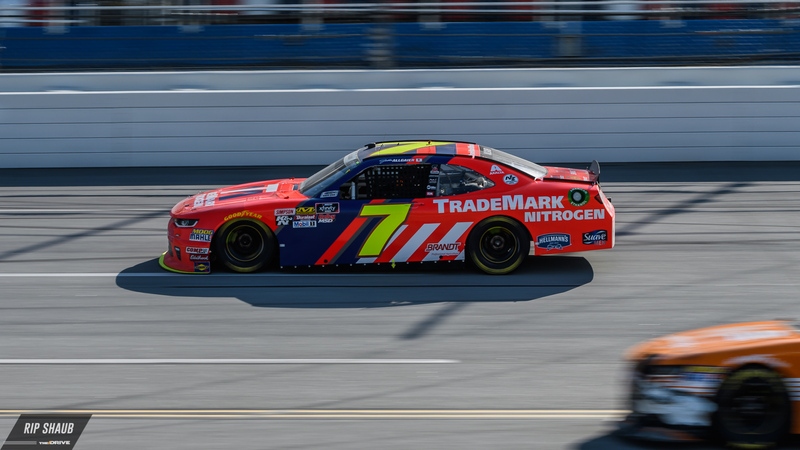 The JR Motorsports driver, who's competing in his 21st NASCAR season, basked in the lead all the way through the end of the second stage. Sadler's No. 1 Chevrolet proved to be competitive as he paired the worthy setup with a dash of trick maneuvering, but an unfortunate bit of contact knocked him off the top which made way for a new slew of drivers. Elliott was able to manage a fifth-place finish, winning the weekend's $100,000 purse as part of the "Dash 4 Cash" contest. Justin Allgaier's No. 7 car led the majority of the third and final stage and was stalked by Austin Cindric in his Roush Fenway Ford. The latter survived a huge spin on Lap 61, somehow without any damage to his car or the rest of the pack, and sprinted towards the front. Cindric put the pressure on Allgaier through the final laps and eventually passed him as the race went under caution, sending the race into its closing moments. Despite his seemingly-ideal position, Cindric's No. 22 car stumbled on the restart and surrendered the lead which flip-flopped between Tyler Reddick, Brandon Jones, and Spencer Gallagher's No. 23. Reddick took an offensive position and warned the No. 23 car of overtaking, though it proved ineffective. Gallagher moved past on the final trip 'round the tri-oval and celebrated in Victory Lane at race's end.